I hope you didn’t think we were on summer vacation. Well, we might have gone on a little one, but we paid attention to the action this past month of various HepsNation members competing all around the world. Time for a quick recap. A number of HepsNation alumni had great performances at the USATF National Club Championships on July 11th in New York City. 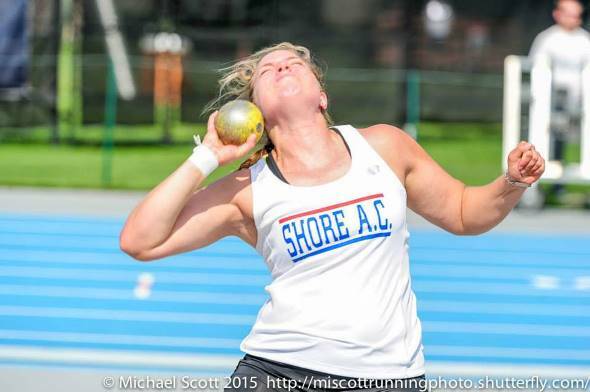 Emmaline Berg (Dartmouth) walked away t two national titles, winning the shot put (15.10m) and discus throws (47.18m), helping her club team Shore Athletic Club finish 3rd in the team standings. Peter Roach (Cornell) won the pole vault with a 4.90m clearance. Tom Hopkins (Princeton) won the long jump (7.56m) and finished 3rd in the 110 hurdles (14.40). Stephen Mozia (Cornell) finished in the top 3 in both the shot put and discus throws with marks of 17.22m and 58.33m, respectively. Other top 3 finishers include Justin Frick (Princeton – 2nd in high jump), Bryan Powlen (Brown – 3rd in discus throw), Victoria Imebsi (Cornell – 3rd in javelin throw), Myles Marshall (rising Harvard frosh – 2nd in 800m), and Kyra Caldwell (Columbia – 3rd in 400m hurdles). Michael Scott has two full photo albums (1 | 2) from this meet on facebook – feel free to view and tag athletes/friends. Princeton had two of their undergrads compete in Gwangju City, South Korea at the World University Championships. Julia Ratcliffe, representing New Zealand, had some great competition in the hammer throw with Azerbaijan’s Hanna Skydan and Poland’s Joanna Fiodorow. In the end, Ratcliffe earned the bronze with a best distance of 67.54 meters. Skydan won with a mark of 70.67 meters, followed by Fiodorow with 69.69 meters. Kim Mackay got the chance to represent Team USA in the individual 800m and 4×400 relay. She ran 2:10.70 in the 800m preliminary round; unfortunately, it was not fast enough to advance to the finals. She later ran the 3rd leg on the bronze medal winning 4×400 relay (3:37.20). Poland won the event in 3:31.98, followed by Russia in 3:32.46. A recent graduate and some current undergrads got the opportunity to compete at the European U23 Championships in Tallinn, Estonia. Recent Harvard graduate Molly Renfer represented Switzerland, where she finished 11th overall with a time of 4:18.36. Princeton undergrad Elizabeth Bird, representing Great Britain, finished 12th in the finals of the 3,000m steeplechase with a time of 10:04.42. Yale undergrad Kevin Dooney represented Ireland in the 10,000m, finishing in 11th place with 29:58.41. Rising Harvard freshman Kat Gillespie got the opportunity to compete at the European U20 Championships in Eskilstuna, Sweden, where she finished 5th in the 1,500m final with a time of 4:25.64. Gillespie represented Great Britain. 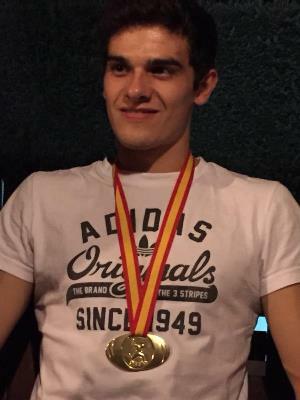 Bruno Hortelano-Roig won a national title at the Spanish National Championships this past weekend. He won the 200m in 20.84. He first won this title in 2013. If Hortelano wants to qualify for the IAAF World Championships, he’ll need to run a 20.50 for faster – his current season’s best is 20.74 but he holds the Spanish national record with a time of 20.47. Ben True got his IAAF qualifier in the 5,000m on July 18th. He finished 3rd at the KBC Nacht Meeting in Belgium with a season’s best time of 13:06.15, crushing the standard of 13:23.0 (his previous best of 13:29.48 was from his win at the adidas Grand Prix, where he became the first American man to win a Diamond League 5,000m event. He had to outkick Nick Willis, a New Zealander who won the silver medal in the 1,500m in 2008, and Thomas Longosiwa, a Kenyan who won the bronze in this event at the 2012 Olympics). What was even more impressive was that he bested some sub-13 minute athletes and was steps away from winning the event, as Dejen Gebremeskel won in 13:05.38 (a Worlds medal contender and 2012 Olympic silver medalist in the 5,000m) followed by Bashir Abdi in 13:06.10. Will Geoghegan was also in the race, finishing back in 15th place with a time of 13:17.85 – a HUGE PR as his previous best was 13:43.22. Joe Stilin ran in a later 5,000m heat, finishing in 10th place with a time of 13:37.27. In the women’s equivalent at that meet, Abbey D’Agostino set a new personal best with a 15:03.85 that was good enough for 3rd place. It betters her WC qualifier that she set at USA’s back in June (15:06.59). Letsrun did a great, detailed recap of the meet that you can read here. D’Agostino and Geoghegan have done plenty of other European racing this summer. Both of them earned dominant wins at the Cork City Sport Games in Ireland in very breezy conditions – D’Agostino in the 3,000m (8:58.39) and Geoghegan in the mile (3:59.08). Geoghegan stuck around on Irish soil for a second meet, the Morton Games, racing the 3,000m where he finished 2nd in 7:48.79 behind winner Sam McEntee (7:48.35). D’Agostino ran a new personal best of 4:08.78 in the 1,500m at the 2015 Guldensporen Meeting in Belgium to finish in 2nd place. Liz Costello was in another 1,500m heat, where she finished 6th with 4:18.79. Costello was also in the Cork City Sports 3,000m race, where she finished 6th in 9:10.73. Geoghegan had some Ivy company in those Irish races, as Kyle Merber joined Geoghegan in that Cork City Sports mile, finishing in 3rd with 4:01.43, while Stilin raced the Morton Games 3,000m and finished in 8th with 7:55.05. Merber went a little longer in distance while in Spain, as he finished 3rd in the 3,000m at the 33rd Meeting Madrid in 7:52.95. This was the first time he’s raced the 3,000m since his sophomore year at Columbia where he ran an 8:09.01 at the New Balance Collegiate Invitational. Don’t worry – we won’t fall this far behind again this month. The highlight will be the IAAF World Championships in Beijing, but there are a number of other local and international meets that we will remain on top of. Stay tuned. This entry was posted on Friday, August 7th, 2015 at 8:53 am. It is filed under Alumni, Spotlight. You can follow any responses to this entry through the RSS 2.0 feed.